America’s number-one game is back! Watching an NFL preseason game in comparison to a regular-season game is like night and day. All 32 teams are in many ways showing why the NFL game is, by a wide margin, America’s number-one sport. In the early 1980s, the NFL passed Major League Baseball (MLB) as the number-one-viewed game in the United States. As we know, MLB may have fallen even further behind in 2018 because of dwindling numbers. One factor could be that 75 percent of the NFL players are Black, while only eight percent of MLB players are American-born Black. The controversial protests by some players during the national anthem the last two years, ignited by quarterback Colin Kaepernick, have been a source of division among the owners, fans, some media and players. Some sports fans were irritated with the players’ choice to protest and their right to do so. Vikings players, you may have noticed, have stayed away from even talking about the swirling protest, much less taking a knee. 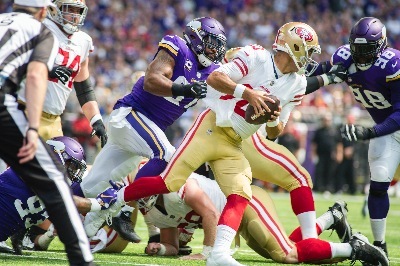 Many claim it’s not how you start but how you finish but the Vikings’ 24-16 victory over San Francisco Sunday was important. This week, the team will travel to Green Bay for an early Division tussle that will test which team can take early control of the NFC North. Green Bay rallied to beat the Bears Sunday night in the two teams’197th meeting. If the Packers, celebrating their 100th season, were to win, they would be 2-0 in the Division. This Vikings team, however, with quarterback Kirk Cousins and this dominating defense —that forced four turnovers against the 49ers — has the potential to be among the best in franchise history. Their eyes as a team are clearly on the big prize.